"It's down to the negotiators to break the deadlock. Or, your men will have to storm the embassy." An official full-length trailer has debuted for the true story action thriller film 6 Days, about the attack on the Iranian Embassy in London in 1980. The standoff lasted for six days, with a group of SAS soldiers eventually breaching the embassy to put an end to the horror. 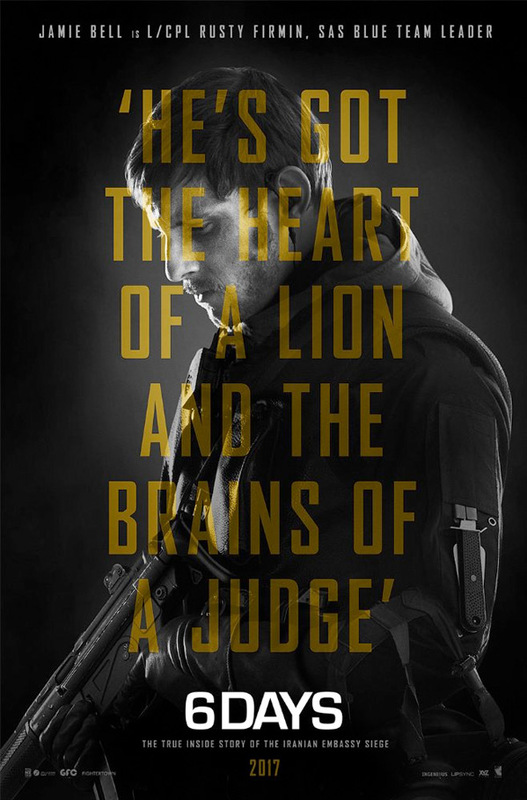 Jamie Bell stars as one of the special forces soldiers tasked with leading the raid. This also stars Mark Strong, Abbie Cornish, Emun Elliott, Nicholas Boulton, Martin Shaw, and Tim Downie. 6 Days is the latest film from the director of the Maori action film The Dead Lands. This actually looks damn good, with an impressive cast that makes it worth watching. In April 1980, six armed gunmen stormed the Iranian Embassy in Princes Gate, London, taking 26 people inside hostage. Over the next six days a tense standoff took place, all the while a group of highly trained soldiers from the SAS prepared for a raid, the likes of which the world had never seen before. 6 Days is directed by up-and-coming British filmmaker Toa Fraser, of Naming Number Two, Dean Spanley, Giselle, and The Dead Lands previously. The screenplay is written by Glenn Standring, who did extensive research and interviews with various individuals who played a key part in the days leading up to, during, and after the Embassy siege. 6 Days is set to open in the UK starting August 4th, but still has no US release date yet.